Ultrasonography, although non-specific, is useful for discriminating between intra-articular and extra-articular disease. We report the case of early pyoderma gangrenosum in a 77 year old woman with seronegative polyarthritis. Pyoderma gangrenosum (PG) is an uncommon ulcerative skin condition which may occur in association with a wide variety of systemic diseases—for example, chronic inflammatory bowel disease. In a study by Holt et al it was suggested that PG is associated with inflammatory polyarthritis.1 Its prominent features—namely, pain, oedema, and discolouration at the joint level, may resemble those of rheumatoid synovitis or even septic arthritis. Consequently, an early diagnosis of PG is difficult to make. A 77 year old woman presented with painful swollen ankles associated with fever and weight loss. She had no history of trauma. One year before she had been diagnosed with rheumatoid factor negative polyarthritis based on the findings of a symmetrical inflammatory polyarthritis affecting the metacarpophalangeal and proximal interphalangeal joints of both hands and the metatarsophalangeal joints of the feet. The arthritis subsided on treatment with sulphasalazopyridine (2000 mg/day). On examination at admission both ankles were very painful and showed some non-pitting oedema and erythematous discolouration. Moreover, there was clinical evidence of active synovitis of the left ankle. Synovial fluid of the left ankle had low viscosity and was sterile on culture. An intra-articular injection with corticosteroids reduced the symptoms of fever and pain for some days. Laboratory investigations showed an erythrocyte sedimentation rate of 70 mm/1st h, a C reactive protein of 129 mg/l (during admission rising to 210 mg/l), haemoglobin 6.5 mmol/l, and a white blood cell count of 14.5×109/l. Rheumatoid factor and antinuclear antibodies were negative. Antineutrophil cytoplasmic antibodies, p type, were positive 1/320. Repeat blood cultures were negative. Joint and bonex ray examinations of the lower legs were normal. Sonographic examination of the distal pretibial region was performed before specific clinical symptoms of PG were present. The left ankle showed fluid between the tendon apparatus and the periosteal bone, and the arthritis seemed to have disappeared. The right ankle seemed normal (fig 1). 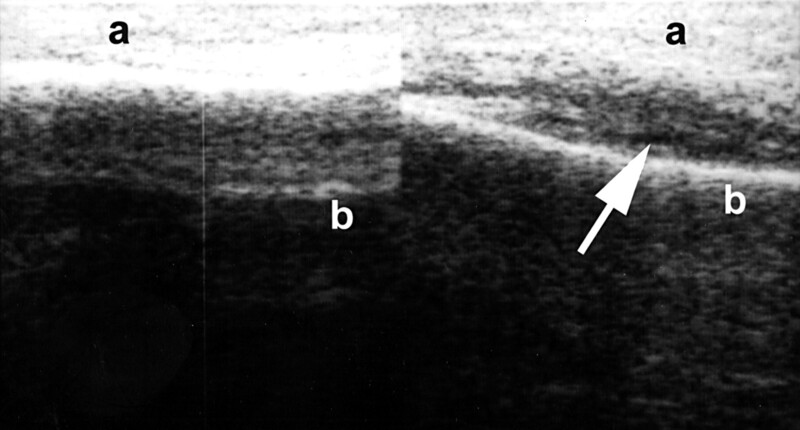 Ultrasonography of the distal pretibial region: the normal right leg (left) and echo-poor areas (arrow) in the left leg (right). a = position of the transducer at the skin surface; b = bone of the tibia. In addition, technetium bone scintigraphy disclosed a remarkably increased uptake of the isotope in the soft tissues of the lower legs, especially at the left medial site. The bones and joints of the lower legs showed a normal uptake. In the meantime the areas of striking blue colour correlating with the aforementioned findings had evolved into ulcers around both ankles. Histopathology of a lesion displayed oedema, a moderate perivascular lymphocytic and histiocytic infiltrate without endothelial necrosis, and abscess formation. Cultures for aerobic and anaerobic bacteria, and cultures and specific stains for mycobacteria and fungi from the pustular lesions were negative. Sigmoidoscopy, bariumx ray studies, a rectal biopsy, and a computed tomography study of the thorax and abdomen were normal. Ultimately, the clinical picture together with the histopathological findings led to a diagnosis of PG. Treatment was started with prednisolone 60 mg/day. The PG lesions healed and the dose of corticosteroids was tapered. The joint disease remained quiescent. In this case report we have shown that ultrasonography is also useful in accelerating the diagnostic process in a soft tissue disease like PG, before the clinical signs are fully developed. The scope of musculoskeletal ultrasonography in daily rheumatology practice is expanding. (1980) Pyoderma gangrenosum. Clinical and laboratory findings in 15 patients with special reference to polyarthritis. Medicine (Baltimore) 59:114–133, . (1972) Ultrasound B—scanning in the differentiation of Baker's cyst and thrombophlebitis. Br J Radiol 45:729, . (1989) Ultrasonography of the adult hip joint. Scand J Rheumatol 18:113–117, . (1998) Is sonography performed by the rheumatologist as useful as arthrography executed by the radiologist for the assessment of full thickness rotator cuff tears? J Rheumatol 25:1800–1806, .